Automatic voter registration (AVR) is an innovative policy that streamlines the way Americans register to vote. AVR makes two simple, yet transformative, changes to the way our country has traditionally registered voters. First, AVR makes voter registration “opt-out” instead of “opt-in”—eligible citizens who interact with government agencies are registered to vote or have their existing registration information updated, unless they affirmatively decline. Again, the voter can opt-out; it is not compulsory registration. Second, those agencies transfer voter registration information electronically to election officials instead of using paper registration forms. These common-sense reforms increase registration rates, clean up the voter rolls, and save states money. AVR is gaining momentum across the country. Currently fifteen states and D.C. have approved the policy, meaning that over a third of Americans live in a jurisdiction that has either passed or implemented AVR. A brief history of AVR’s legislative victories and each state’s AVR implementation date can be found here. 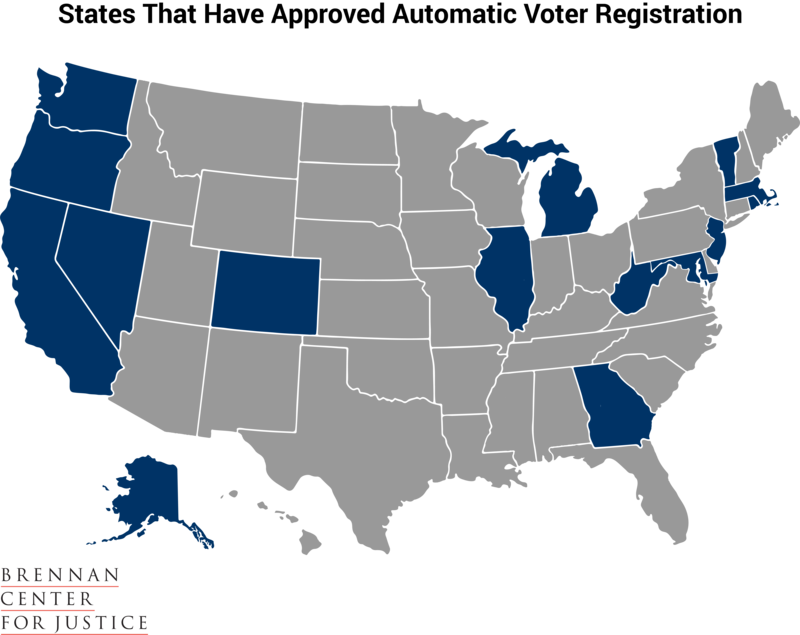 In this legislative cycle alone, twenty five states have introduced legislation to implement or expand automatic registration. A full breakdown of these bills, as well as those introduced in 2015, 2016, 2017, and 2018 is available here. The results have been exciting. Since Oregon became the first state in the nation to implement AVR in 2016, the Beaver State has seen registration rates quadruple at DMV offices. In the first six months after AVR was implemented in Vermont on New Year’s Day 2017, registration rates jumped 62 percent when compared to the first half of 2016. The benefits of AVR extend beyond increasing the number of people registering. The policy keeps voter rolls more accurate by creating a constant stream of updates between registration agencies and election officials and by reducing the odds of mistakes caused by processing paper registration forms by hand. Cleaner rolls reduce errors that cause delays on Election Day and prevent eligible voters from casting regular ballots. AVR also lowers costs. For example, the transition to electronic transfer allows states to save money on printing, mailing, and data entry. Opt-out and electronic transfer are the two necessary components of AVR, but states’ policies still vary in the details. An in-depth dive into those differences and each state’s policy can be found at our Policy Differences of AVR page. Many other states have made considerable strides updating their election infrastructure that have come short of implementing AVR. For a list of these reforms, see our Related Advancements in Voter Registration page. Our current voter registration systems are onerous and outdated. Too often, registration stands as a significant obstacle to access to the ballot. AVR offers a new way forward that can help to open access to the franchise and improve American democracy. Particularly at a time when many states have enacted restrictive voting laws and voter turnout has hit record lows, AVR is a needed reform.